The crime problem in our nation is both costly and demoralizing. Directly or indirectly we are all affected by crime that has caused injury, financial loss and intimidation. These situations demonstrate vividly the need for community involvement and assistance in crime prevention, reporting and efforts in the Rahway Police Department Neighborhood Watch Program. This community-based crime prevention program is a simple and direct approach toward protecting our community from criminal attacks. The program involves the reduction of criminal opportunity through citizen participation in crime prevention measures, such as being alert and aware, reporting suspicious and criminal activity to the police, and initiating actions which reduce criminal opportunity. 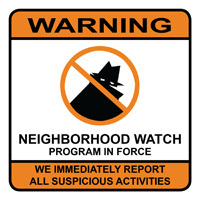 In these times of reported apathy within our communities, it is encouraging to find the concern and involvement you and your neighbors display with neighborhood watch efforts. The Rahway Police Department stands ready to assist and support you with this program.